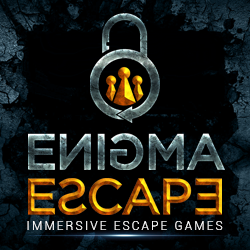 Enigma Escape’s selling point is that they make “immersive” escape games. What they mean by this is that their rooms try to tell a story with consistent internal logic. Many of the computer versions have you hunting for random clues in random places with no attempt at justification. For Enigma, if you need a key to escape, perhaps there’s a spare, so where might an insane murderer keep it? This is a difficult task to create a world with consistent rules in a confined space. To their credit, Enigma almost pull it off. The construction of the room oozes quality, the puzzles are logical and solvable and, if you do get stuck, good hints come in over a small TV screen from the friendly game host. A couple of small slips briefly take you out of the world but, for 95% of the time, you really do feel that you’re in the lair of a killer so it’s not for the faint of heart. There were four of us on the day and it was quite crowded in the room. The design of the room meant we were able to split into two teams a couple of times rather than all working on one puzzle. The maximum team size is officially five, but you’d probably find yourselves treading on each other’s toes a lot. At the other end of the scale, it would be a decent challenge with just two of you, but certainly achievable. I’ve just learned that Enigma now have a second room open. I don’t think I can offer higher praise of The Killer than to say we’re already planning to pay them a repeat visit early next year.